Google has just sent out press invites for its Android event that'll be happening on July 24 at 19:00 GMT in San Francisco. 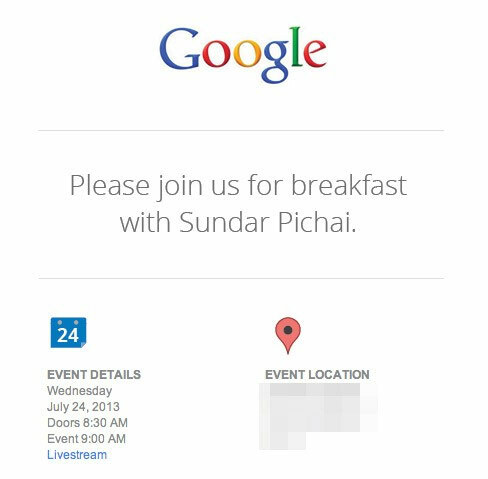 The photo that the company attached simply reads "Please join us for breakfast with Sundar Pichai." Pichai, the VP of Android and Chrome, sure has some cool news to share regarding the next version of Google's mobile OS. Android 4.3 Jelly Bean has been out for a while now for the Google Play Store edition Samsung Galaxy S4. We took if for a spin, but, didn't find too much new stuff inside, so we are hoping it wasn't the final build. Hopefully, at the event happening next Wednesday, Google will unveil more changes to Android. Android 4.3 is said to still carry the Jelly Bean name. It seems that Android 5.0 Key Lime Pie will be unwrapped at the next Google I/O. Additionally, the second-generation Nexus 7 tablet is expected to be announced. It's been heavily rumored to pack a 7" display of full HD resolution and a Snapdragon 600 CPU. ASUS is said to be responsible for building the next Nexus tablet. Any news about this event.. As to what transpired?